During the hustle and bustle of everyday life, nothing is more appreciated then warm-wishing customized logo greeting cards. Whether you use imprinted greeting cards for corporate events, launching days, or to welcome new clients to your business, custom promotional greeting cards make a thoughtful message give a big marketing impact. Clients will feel honored, employees will feel valued, and customers will be thankful for your kind, thoughtful gesture. And since your customized greeting cards will be put on display, in the office or at home, your logo will receive maximum exposure. IASpromotes.com stocks a generous assortment of custom promotional greeting cards. 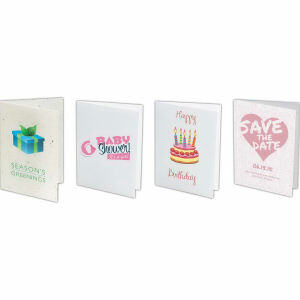 Personalize our many available styles with your company name, corporate logo and business contact information and start sending logo imprinted greeting cards to clients and customers. They will instantly notice your consideration and pass that information along to family and friends.